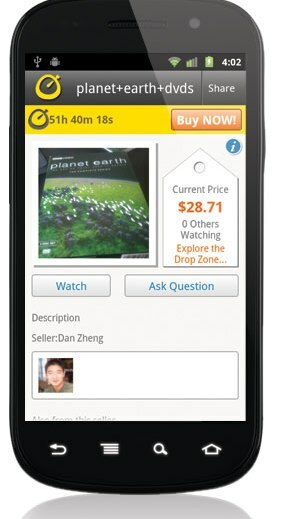 EggDrop, essentially a mobile app alternative to Craigslist, is starting to pick up steam. The company now boasts half a million downloads of its app on iOS and Android, with $8 million in listings from across the 50 U.S. states and the U.K. (EggDrop’s top two markets). The app originally launched last June, backed by $1 million in funding in a round led by BlueRun Ventures and SV Angel. But that first experience doesn’t look much like EggDrop today. In November, the company rolled out a major update (ver. 2.0) which completely replaced the auction format found in the original with more traditional marketplace-style listings. Since then, over 5,000 items have been sold within the app, including electronics, games, furniture, and even grand pianos and wedding dresses. With the first version of EggDrop, the idea was to introduce a somewhat unique pricing model – the “falling price” auction. Instead of setting a price for an item, the seller would enter both a minimum and maximum price. Over 72 hours, the price would gradually fall if there were no takers. As it turned out, that system didn’t prove to be a hit with users. Now, sellers just create a normal listing with whatever price they want, and leave it up indefinitely, if they choose. In fact, the setting to automatically re-list the item after 7 days is switched on by default, so, unlike with Craigslist, sellers don’t have to continually return to create a new posting. However, if the item is of a time-sensitive nature – like concert tickets, for example – users can configure the item to expire. Currently, EggDrop is proving popular in major metro areas in the U.S., starting with L.A. and followed by (in order) New York, Chicago, San Francisco, Atlanta, Miami, Dallas, D.C., Detroit and Denver. Outside the U.S., there’s been some adoption in London, Manchester and Birmingham, U.K. and even a bit of uptake in other regions like Australia, Canada, Argentina and Spain. This, despite the fact that the company hasn’t made any efforts at localization, only a bit of translation work to support Spanish. Zheng doesn’t have exact numbers on how much of the user base are in these top U.S. metro areas, but if he had to guess, it would be over half the app’s users. He also notes that roughly a quarter of the users (25%-30%) are either moms or students, looking to clean out closets or save a few extra dollars. Interestingly, one of EggDrop’s key selling points – its ability to cross-post listings to Craigslist – hasn’t had a major impact on the app’s adoption. It’s a very small percentage of users that discover the app that way, something in the “single digits,” says Zheng. Instead, users are finding the app through old-fashioned means: word-of-mouth, app store searches, and, for a week earlier this year, through a “featured” listing on the Google Android Market…Google Play store. While all the above numbers refer to organic listings created by EggDrop users, at any given time, 5% of the listings are from external, third-party sources, namely Craigslist. Zheng says the team is careful not to include too many of these. “I’m pretty mindful of the balance between organic listings and third-party listings because the experience is slightly different. I really don’t want to confuse users,” he says. Over the past few weeks, the company has added a couple of notable features to the app: a built-in anonymous messaging feature that allows buyers and sellers to communicate in real-time without having to share mobile phone numbers, as well as a new section for “Wanted” listings. With the latter, the idea is that EggDrop will be able to match buyers and sellers based on description, price and location. While originally, the company looked like a modernized take on what Craigslist could be if built in the mobile era, recent events have put the app in closer competition with other newcomers like Zaarly, for example. Up until earlier this month, one of Zaarly’s biggest differentiating features (besides its primary focus on tasks, not goods), was the anonymity of its users. But Zaarly’s revamped reputation system now lets buyers and sellers know exactly who each other are. EggDrop, meanwhile, takes a more middle-of-the-road approach, using badges and “karma scores” to rate transactions, while keeping some aspects of buyer/seller communication anonymous. Now with five engineers on board, including Zheng and co-founder Brian Lynch, the team at EggDrop is working to roll out an iPad-optimized version of the mobile marketplace. No ETA on that just yet. In the meantime, you can download the EggDrop mobile app here.